Cornflower is a member of the daisy family noted for its vibrant azure blue flowers. The plant is called cornflower because it naturally occurs near field crops, namely corn. The plant is also known as Bachelor's Button and Boutonniere Flower because young men once wore the flower in the label of their jacket to draw attention to their eligibility status. Today, cornflower petals are added to tea blends, potpourri, baked goods, soups, salads and custards, or are frozen in decorative ice cubes for iced beverages. active compounds Anthocyanins (anthocyanidin glycosides), sesquiterpene lactone: cnicin, as well as polyacetylenes and flavonoids. appearance & aroma Bright blue flower petals. cosmetic Use in facial steams and to make infusions for the skin and hair. culinary Makes a colorful addition to tea blends. The petals can also be added to baked goods, soups and salads. household In the summer, add petals to the water in your ice cube trays. Adds decorative splash to your patio drinks. 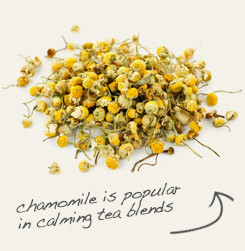 Add visual appeal to your tea blends with chamomile flowers and cornflower petals. 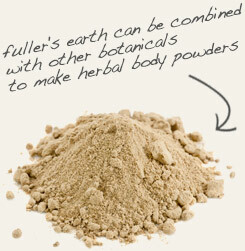 Add fuller's earth to your handmade soap for it's impurity-absorbing benefits and add cornflower petals for splashes of color. Cornflower is lacking in flavor, but does add texture and aesthetic value. Cornflower is an annual plant in the daisy family noted for its vibrant blue-to-purple flowers owing to a blue pigment called protocyanin. It is so-named, because the plant tends to pop up in crop fields. Cornflower is native to Europe, but is now naturalized in other parts of the world, including North America and Australia. Because the flower heads were once worn by young men to indicate their marital status, cornflower is also commonly called bachelor's button and boutonniere flower. The genus name for the plant is a reference to the centaur Chiron, who taught humankind the healing virtue of herbs. The species name, Cyanus, comes from mythology for a youthful devotee of the goddess Flora (Cyanus), whose favorite flower it was. 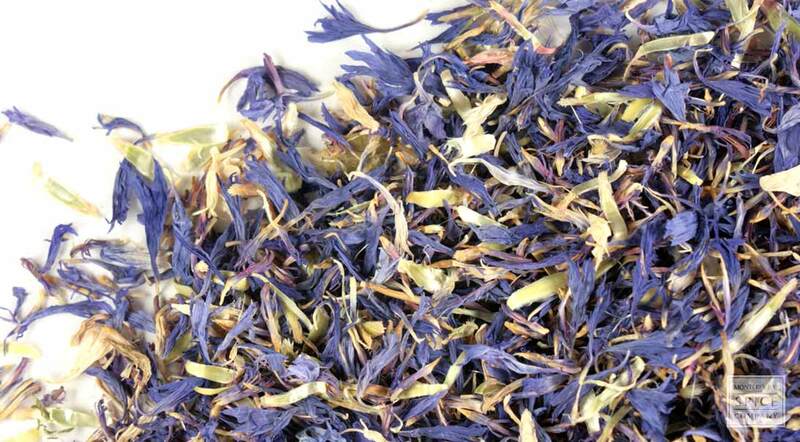 Cornflower petals add lovely color to salads, dressings, baked goods, floral waters and teas. In fact, in terms of the latter, cornflower is a key ingredient in Lady Grey tea. Background: Its Latin name, Cyanus, comes from mythology for a youthful devotee of the goddess Flora (Cyanus), whose favorite flower it was. Tte name of the genus is derived from the Centaur, Chiron, who taught humankind the healing virtue of herbs. Magical properties:"A decoction of the petals, filtered through three layers of linen and ritually consecrated beneath a full moon with a moonstone, were used as an eye bath for increasing clairvoyance : enabling one to see aspects of the universal creative forces." Listed in the French Pharmacopoeia since 1884. It has been used to give eyes a bright sparkling look. A steam-facial of the petals improves look and health of skin.